You know how Google sometimes “predicts” what you might be searching for by giving you a little drop down menu of suggested search queries? 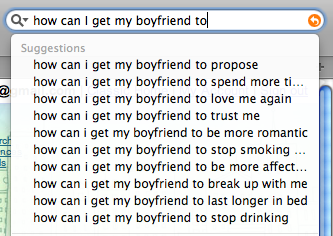 These suggestions, of course, are based on what other users frequently search. So I tried teasing out some gender differences. Look at the pictures below. 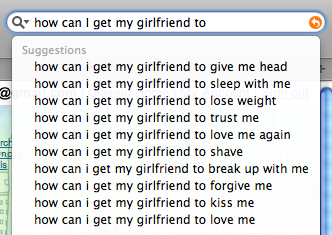 This shows Google’s remarkable power as a source of data on a range of human behaviors, emotions, and opinions. It gives us insights into what people might care the most about concerning a given topic. When people search a particular political leader, what are their main concerns? What are people secretly guilty about? For better or for worse, Google’s obsession with collecting and refining data has given us a window into each other’s fascinating and telling curiosities.